A Short History of Disruptive Journalism Technologies provides a swift analysis of the computerization of the newsroom, from the mid-1960s through to the early 1990s. It focuses on how word processing and a number of related affordances, including mobile-reporting tools, impacted the daily work routines of American news workers. The narrative opens with the development of mainframes and their attendant use as databases in large, daily newspapers, It moves on to the "minicomputer" era and explores initial news-worker experiences with computers for editing and publication. Following this, the book examines the microprocessor era, and the rise of "smart" terminals, "microcomputers," and off-the-shelf hardware/software, along with the increasing use of computers in smaller news organizations. Mari then turns to the use of pre-internet networks, wire-services and bulletin boards deployed for user interaction. He looks at the integration of decentralized computer networks in newsrooms, with a mix of content-management systems and PCs, and the increasing use of pagers and cellphones for news-gathering, including the shift from "portable" to mobile conceptualizations for these technologies. 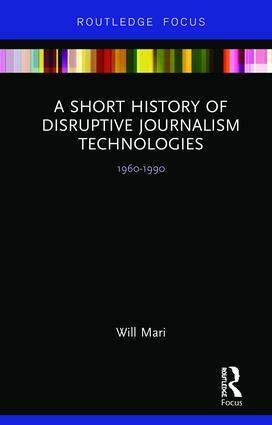 A Short History of Disruptive Journalism Technologies is an illuminating survey for students and instructors of journalism studies. It represents an important acknowledgement of the impact of pre-internet technological disruptions which led to the even more disruptive internet- and related computing technologies in the latter 1990s and through the present. Mari does well to remind us that there is no such thing as a technological revolution. This essential and highly innovative book is a clarion call for longer term assessments of the interrelationship between journalism and technology. Drawing on extensive archival material while at the same time being deeply rooted in the cultural-historical tradition towards technologies of the media, it assesses how computer technology arrived incrementally within news practice. It is an outstandingly well-informed set of reflections for the digital age. Will Mari is Assistant Professor in the Department of Communication, Northwest University, USA. He is a media historian and interested in how technology impacted the lives of news workers, especially marginalized groups such as women and minorities, in newsrooms during the twentieth century. He received his Ph.D. from the University of Washington, USA, and his MPhil from Wolfson College, Cambridge, UK.